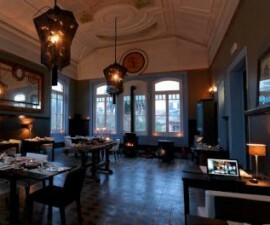 Tucked away in a quiet side street close to the train station in Sintra, Portugal, is Restaurant Dom Pipas. 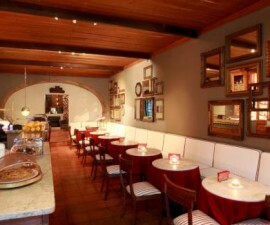 This cosy establishment is in Sintra’s downtown area, off the tourist trail and away from the busiest spots. This is a place where locals come to enjoy good food and a friendly ambience in a place where the prices do not reflect the popularity of this famous town in west central Portugal. Thanks to its quiet location, Restaurant Dom Pipas is not the easiest to find but it is definitely worth seeking out while you are in Sintra. Ask for directions to the train station and cross over the walking bridge when you get there, and the restaurant will be more or less right in front of you on the little side street. A warm welcome awaits you from the front of house staff when you enter the restaurant and the traditional dark wood décor is both traditional and conducive to a convivial atmosphere. If the restaurant is not full the waiters are happy for you to take you pick of the tables – something that is not always the case in busy tourist towns where certain seats are filled first and the best are saved for the local gentry. Restaurant Dom Pipas prides itself on serving hearty, unpretentious dishes that embrace the traditional ingredients and flavours of Portugal. Starters such as Sopa Alentejana and the specials such as Salt cod Pipas style and grilled seasoned sea bass with boiled potatoes and green beans may not sound like fancy Michelin-starred restaurant dishes, but here they are cooked to perfection from fresh ingredients, at a price that is no match for their rich flavours. The wine list is large and varied, with plenty of well-chosen local and national vintages at excellent prices. If you are unsure on what to choose, ask one of the waiting staff for help. A bottle of wine, main and entrée cost around 20€ here depending on what you choose, making it a great choice for anyone visiting Sintra for a few days or more. ?R. João de Deus 62, ?? ?Tel: +351 219 234 278?? ?